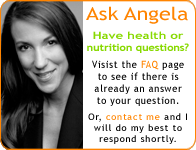 You are currently browsing the Nutrition Basics blog archives for February, 2010. Stocking a healthy pantry with Angela Pifer on MSN Health. Please open this post to view the video. How to Stock a Healthy Pantry: What’s on Your Shelves? The first step to cooking healthy is to stock your pantry with a variety of foods that you can use as a base for a healthy meal. If your pantry needs a healthy makeover, the first thing you’ll want to do is toss the junk and start thinking about which healthy foods you like to eat.